A relatively new tradition for me every Christmastime is to try and make my very own wreath to sit on the front door and great people. Hanging a wreath on the door is the epitome of Christmas decorating and I adore seeing them line the street this time of year, but most of all I love seeing the smile they bring to friends and families faces when they knock the door. I’ll admit it’s one my favourite traditions now and it’s a job I take on all by myself with absolute joy! 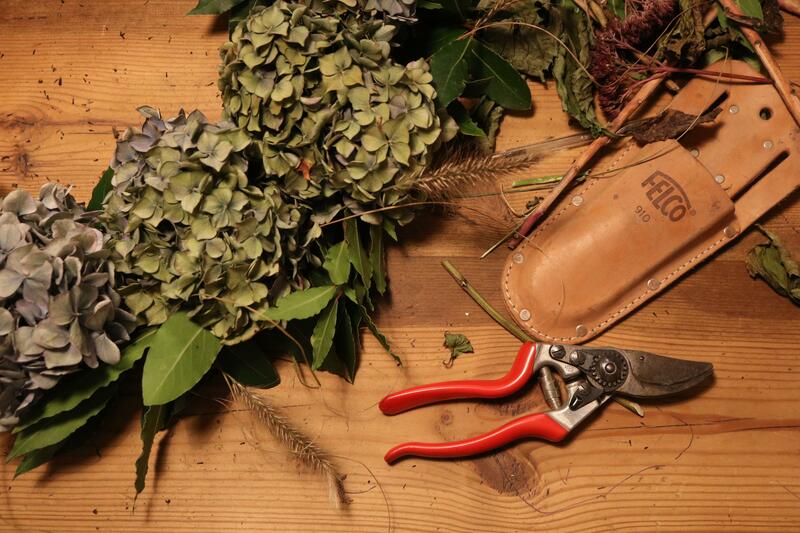 The project starts off by me either foraging in the local woods or seeing what beauties the garden and allotment have provided that year, the past few years the garden has been plentiful and I’ve found myself going back to the same old plants. 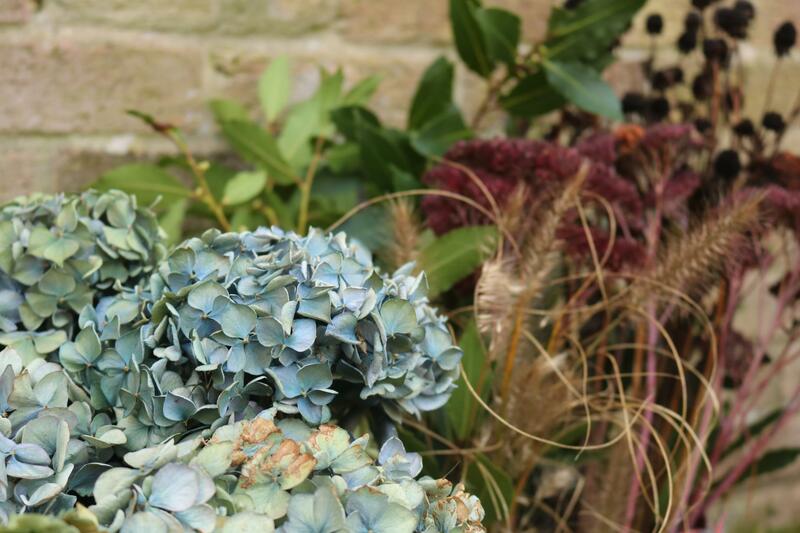 I prefer using dried flowers, seed heads and foliage in my wreath as this means I don’t have to mess around with providing them with moisture via oasis or moss. It makes my job so much easier and also means the wreath can stay hanging on the door for much longer! 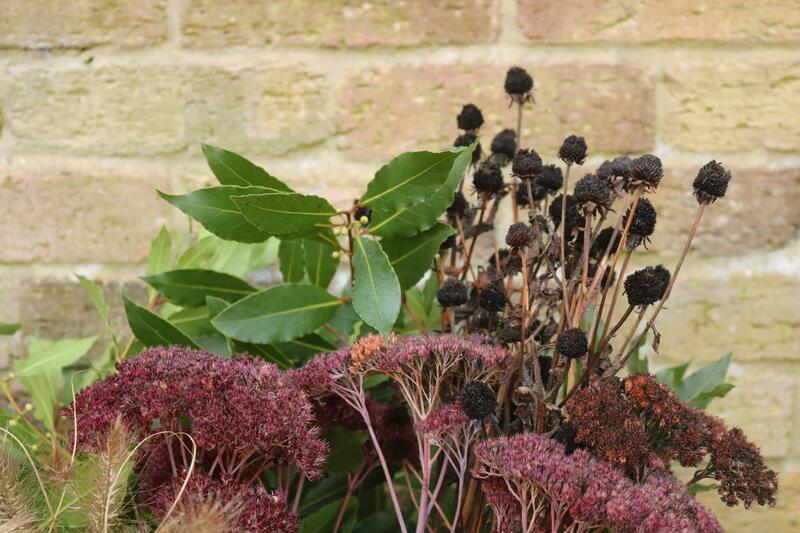 From the front garden I harvested some beautiful red sedum, Pennissetum Alopecuroides grass, Rudbeckia seed heads and the base to my wreath… Bay stems. 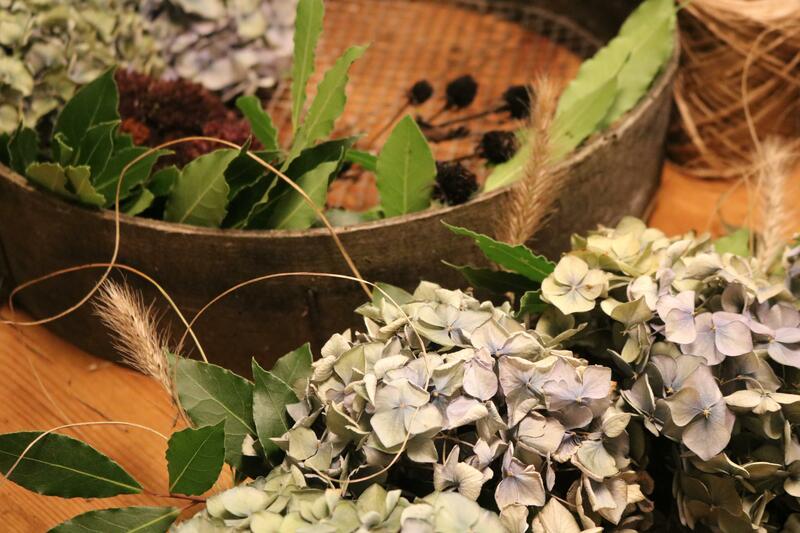 The dried Hydrangea flower heads are my favourite and came all the way from Wales, I picked them a good few months ago now to give them ample time to dry and they remain stunning! 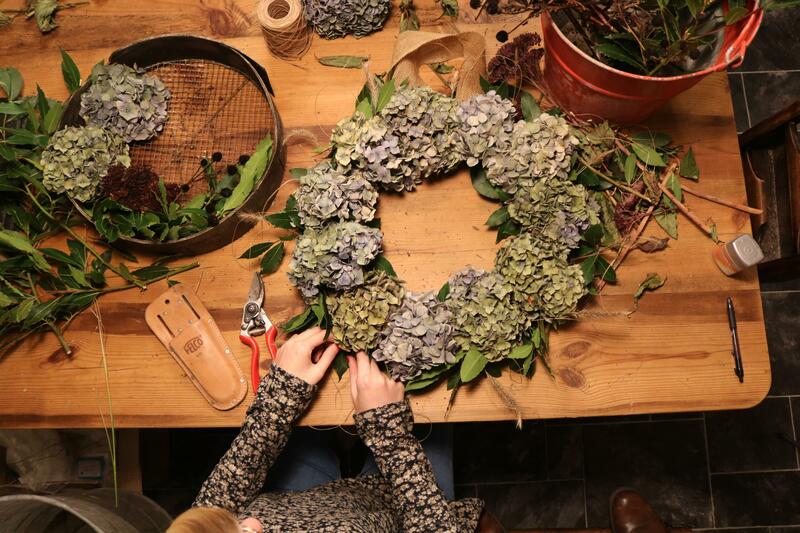 Next is to sit down, get comfy and start building your wreath. I usually do this outside but because the weather has been so awful these past few days I decided to pop on some Christmas tunes and turn the kitchen table into a florist for a few hours. 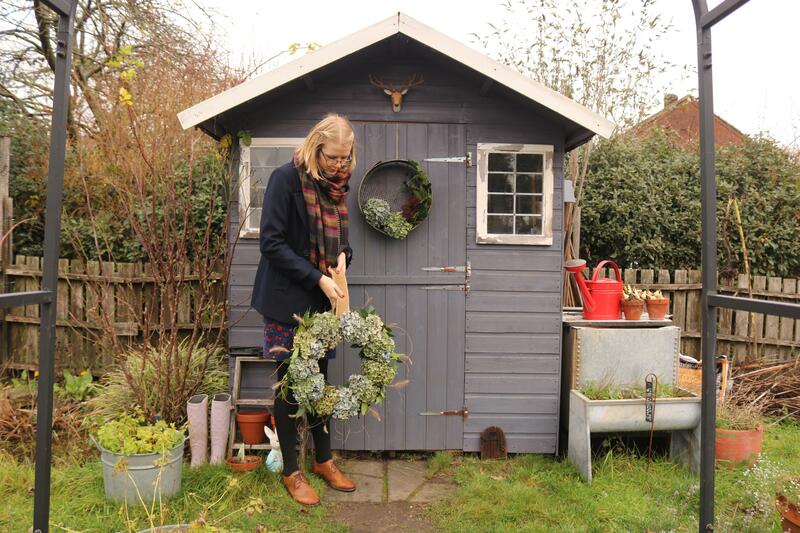 I always tend to use a wire wreath ring to use as the base for my wreaths, it gives me a frame to attach the flowers too and makes sure I don’t produce a wonky wreath… plus I can use the same ring every single year. 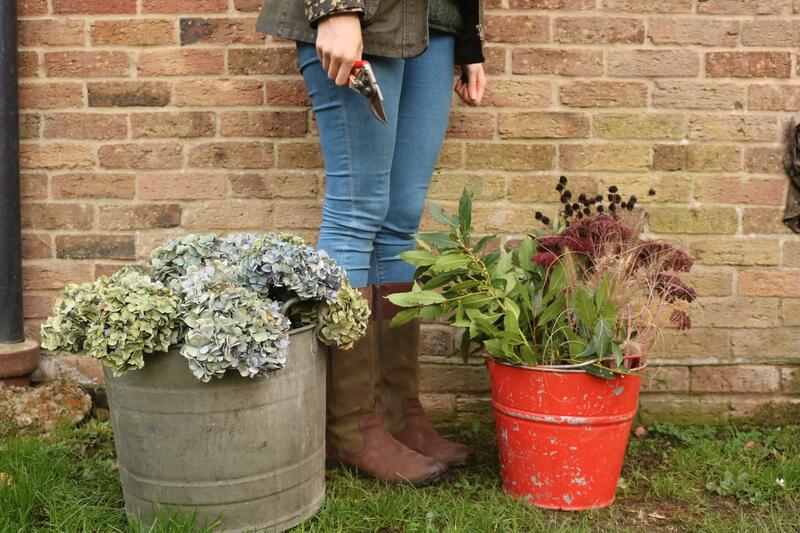 These can be purchased from most garden centres or craft shops for as cheap as £1.00. 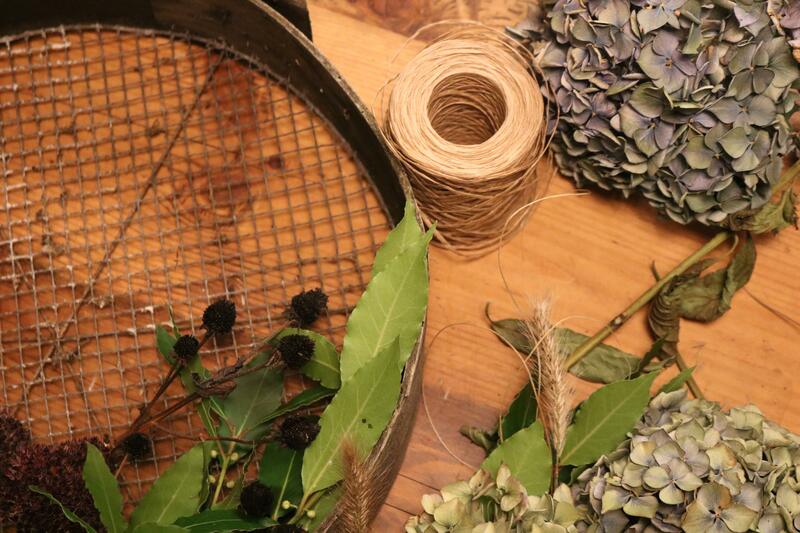 I also use florist wire to attach all my flowers and foliage to the frame, my favourite is a big reel of wire encased in twine by the brand Oasis. 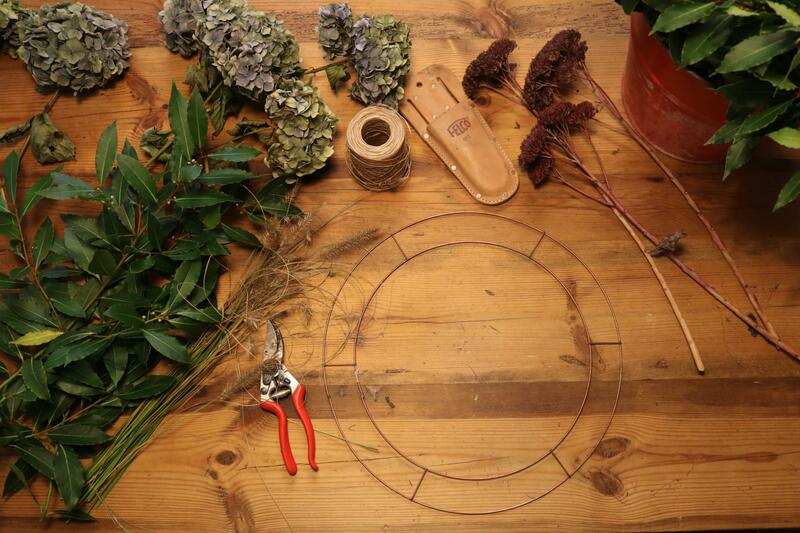 I started by laying down a few bay stems around the outside of the ring before securing them and doing the same with the dried hydrangea heads in the centre. These were a bit more tricky as I was a picky with the sizes and colours but it was worth the time and effort! 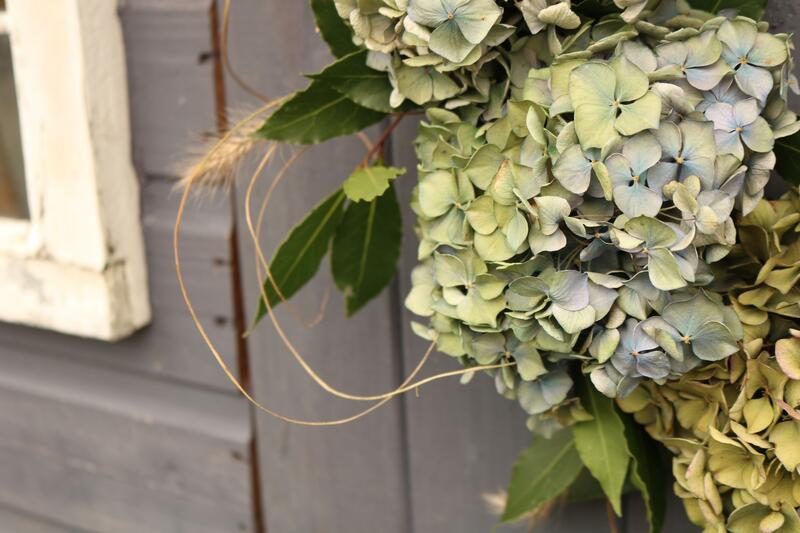 I added a few of the grass stems in amongst the wreath and ended up using one between each Hydrangea head. Last but not least I used an old Hessian cake ribbon to loop around the wire frame so that the wreath can be hung on the door. I decided to leave it like that, simple but effective, sometimes you can go a little overboard and I love the rustic charm to it. 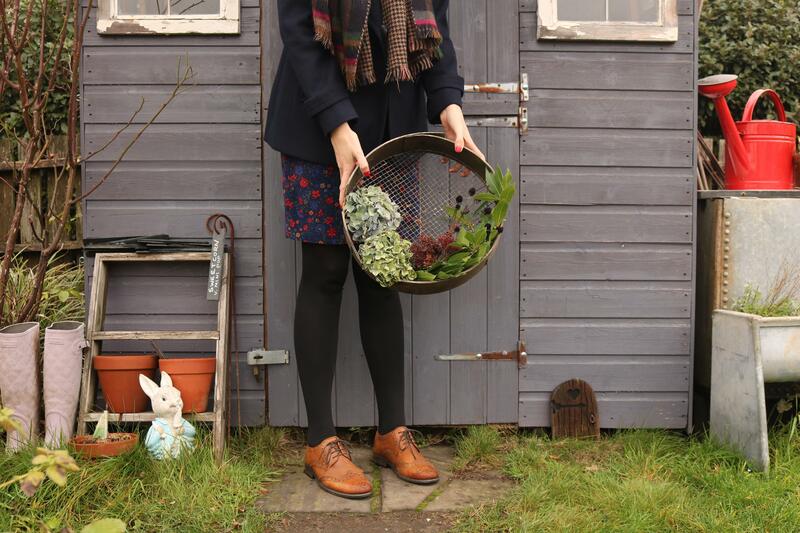 There happened to be a few sprigs of Bay left as well as two Hydrangea heads and because I hadn’t used any of the Sedum or Rudbeckia yet I decided to make a wreath for the allotment too. 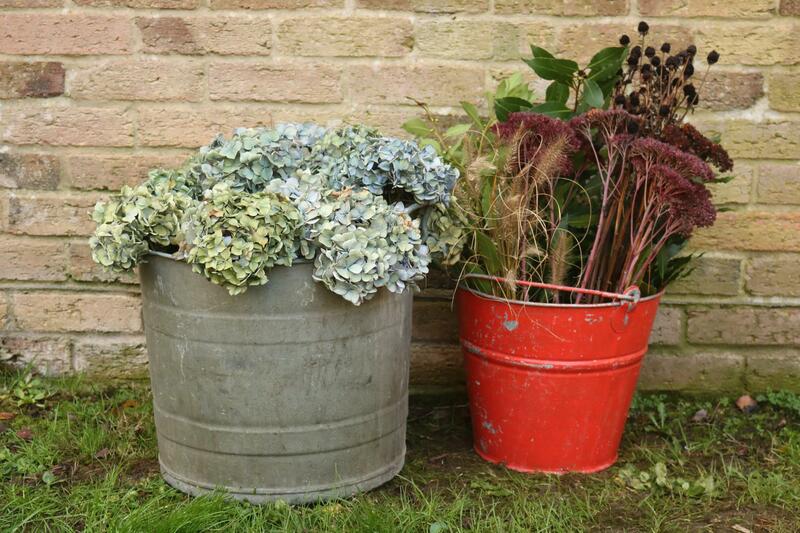 I quickly popped up there to retrieve an old sieve I had hanging on the side of the shed as this was going to be the base of the allotment wreath and then I got to work… three stems of Bay, two sprigs of Rudbeckia seed heads, two Sedum and two Hydrangea heads later and I was done! They were all so easy to attach to the back of the wire mesh on the sieve and I think the end results will suit the allotment, plus the sieve won’t need to be used for a while yet! Early the next day when the sun came out I headed back up the allotment to take a few more photographs of my finished wreaths before we headed out to Mottisfont Abbey for the day. I am just so in love with them and I must say that I think they are my favourite homemade wreaths so far. 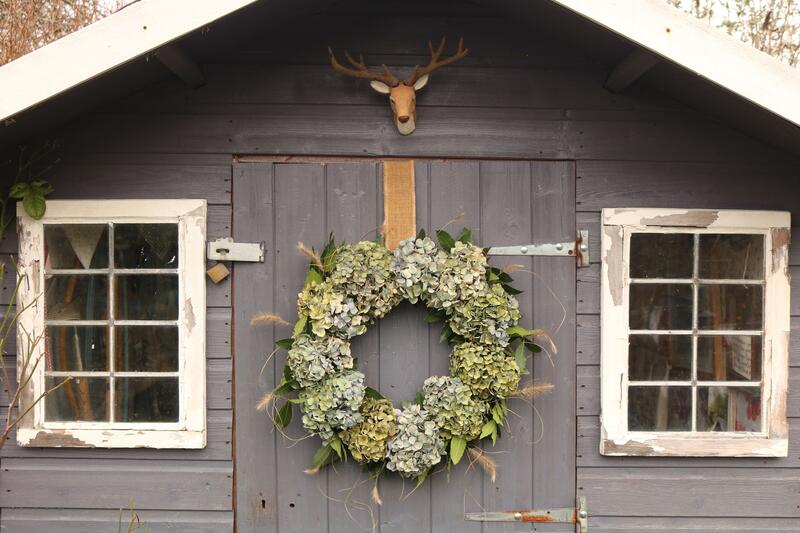 I have absolutely fallen in love with Hydrangeas this past year so it felt very special to incorporate them into this years Christmas wreath and the fact that they were grown on the farm on Wales means so much more to me. 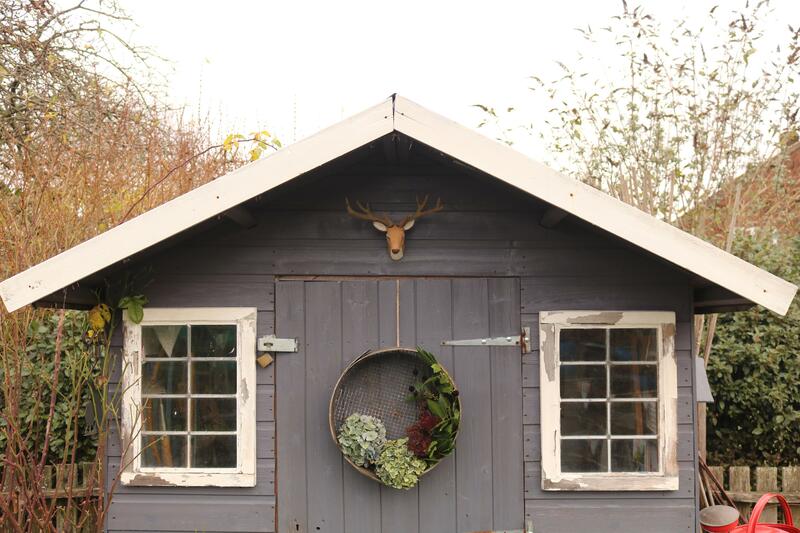 I just love the simple yet rustic look to both wreaths, the colours and texture are perfect and I can’t wait to see everyone’s faces when they knock on the door or pass the allotment site. 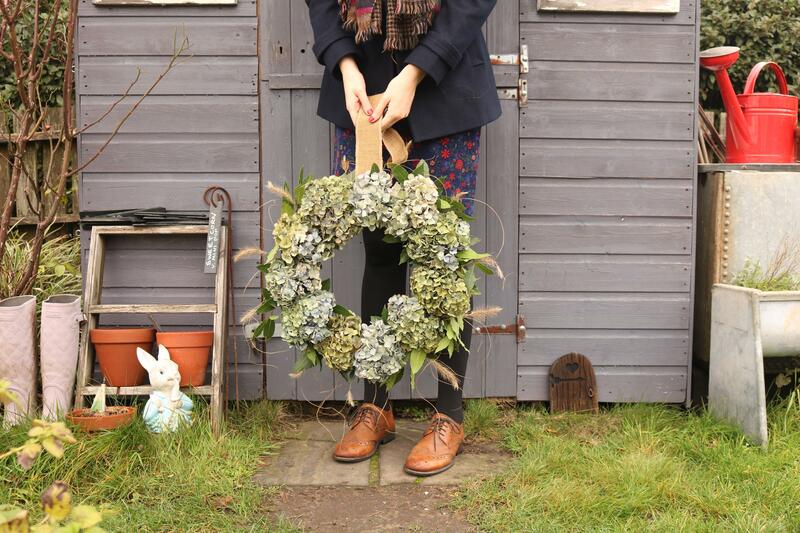 I really hope you’ve enjoyed seeing my handmade wreaths and that it inspires you to go out and make your own. 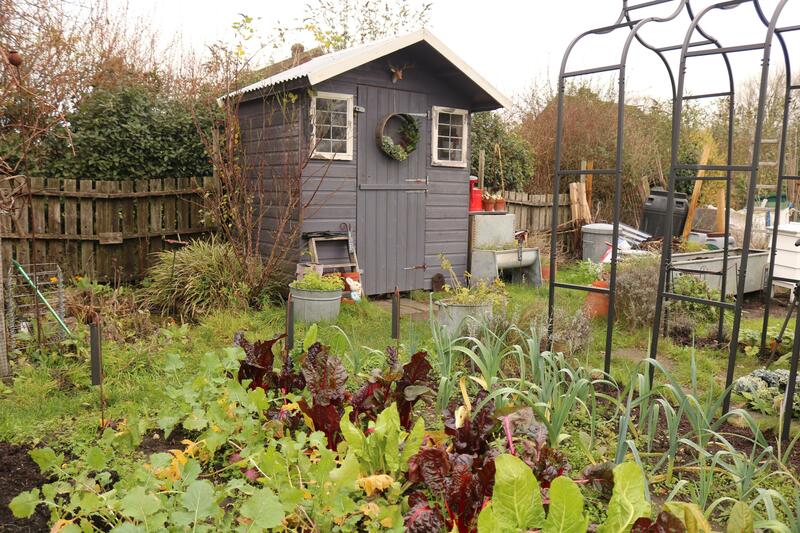 It’s so much fun and I can’t recommend it enough, every time I open the front door now or walk up the allotment path I can’t help but smile at what greats me. I just hope it brings a huge smile to everyone else! 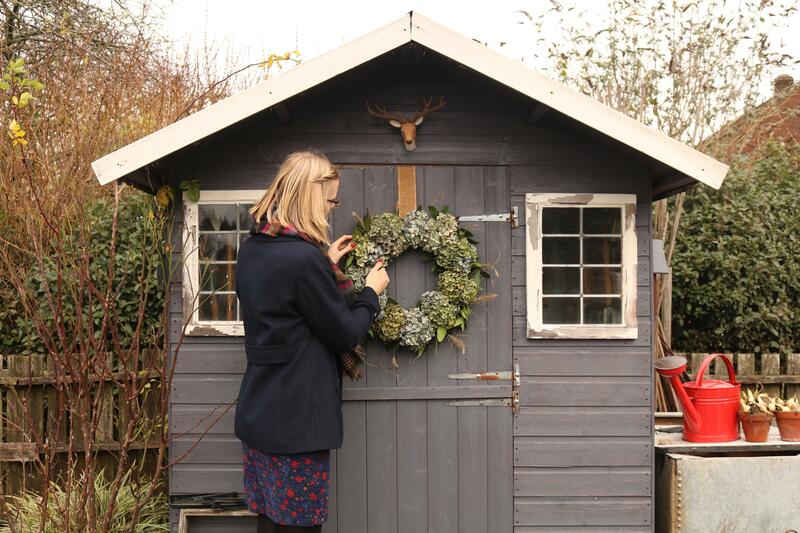 Of course if you don’t have the time to make your own there are plenty of local florists that will stock beautiful wreaths for you to buy. Hi Katie. 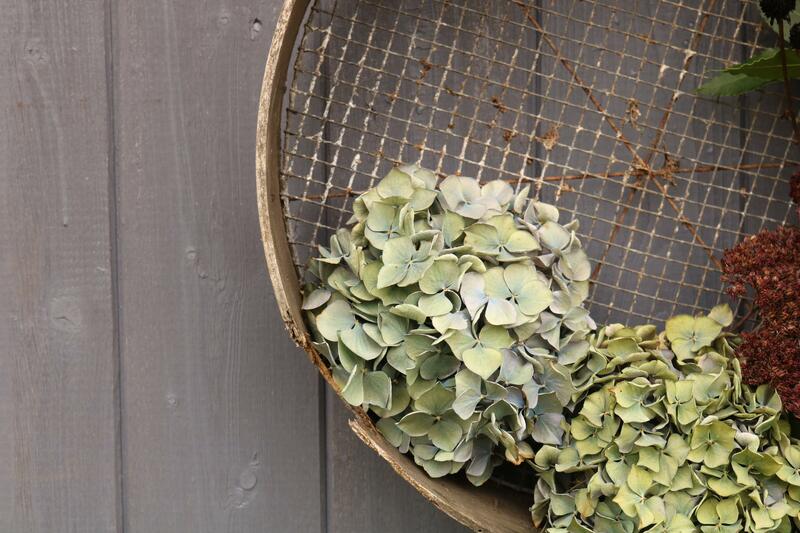 I LOVE LOVE LOVE the dried hydrangea you are using, (especially after seeing Angel use them on Escape To The Chateau last night, too.) I have my front door wreath to give a make over this week, hopefully, if I find time between all the other jobs I have planned! A beautiful end result, well done. Hi Katie…I cheated a tiny bit, bought a lovely silver sparkly one from a charity shop BUT 2 bare basket rings from there too….planning on copying your hydrangea one as I still have some in the garden (faded) and the other one I will pick some holly (with gloves on) from our hedging…only trouble is the berries seem to drop off quickly. 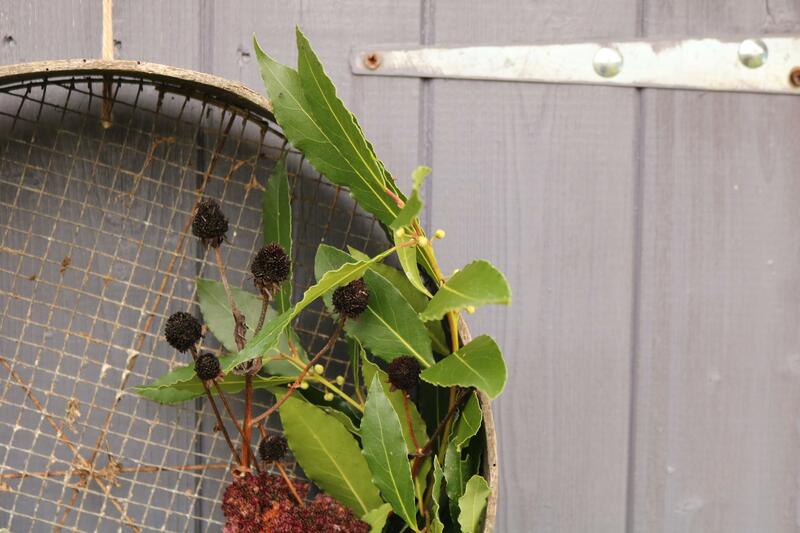 I also have a packet of decorative cherries for hats…will pop those on the holly wreath. Love your ideas….and also your scarf with the fuchsia pink colour in…you are so good at putting an outfit together! !